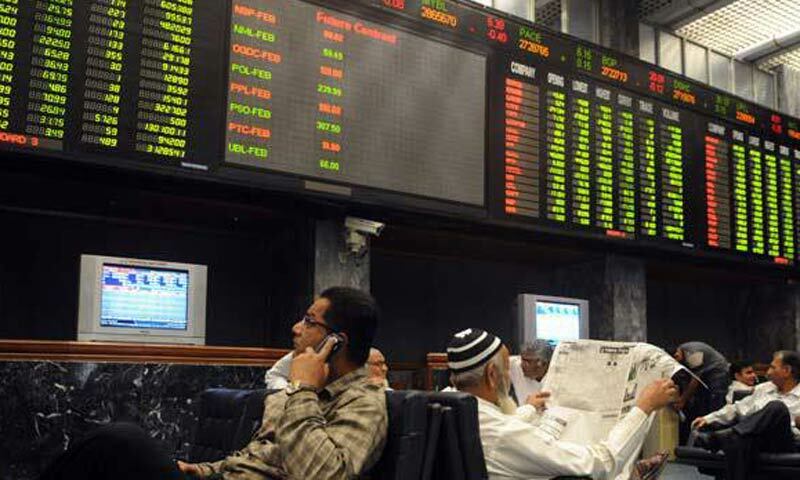 KARACHI: Stocks rallied on Monday spurred mainly by foreign investors who bought (net) $4.94 million worth shares. The KSE-100 index rose 0.72 per cent or 155.17 points to close at 21,754.95. The Karachi Stocky Exchange (KSE) made an effort to catch up with the global equity markets which have recorded huge gains, some climbing to their new peaks during the six day holidays here in the country. When the markets opened on Monday, it witnessed break in the three-week losing streak, with a giant leap in index by 1.8pc or 379 points. However, day end profit taking mainly by local investors limited gains to 155 points. Volume though lower than the year�s daily average at 136m shares, saw a jump by 119pc over the last trading day (the previous Monday) 14-month low turnover at 62m shares. Trading value almost doubled to Rs3.980 billion, from Rs2.057bn the previous trading session. The end of impasse in US over the debt ceiling was a relief to the global equity markets. The great expectations from the prime minister�s visit to the US; the disbursement of $322m under the Coalition Support Fund during the local holidays; the latest news of US resuming $1.6bn in aid to Pakistan and the start of the Sept-end result season were counted as some of the core reasons for the bulls to regain control of the market. Oil & gas; banks and cement were the three sectors that posted major gains. On the oil & gas sector, PSO, POL and PPL were up 1.3pc, 1.6pc and 1.3pc respectively. However, the heavyweight OGDC closed down 0.9pc. On the banking sector, MCB was up 1.6pc and NBP rose 4.0pc. On the cement sector, MLCF, DGKC and Lucky were up 5pc, 5pc and 2.6pc respectively. Analysts said that the earnings season kicked off with Fauji Cement reporting an impressive 61pc YoY growth for 1QFY14 (EPS Rs0.42) underpinning strong fundamentals prevailing in the sector. Engro Foods closed at �lower circuit�, as the word spread around of low profits for 3Q2013; the company is due to announce results on Tuesday. Dealers on sales desk at Sherman Securities stated that banks were up apparently due to buying in NBP by foreigners; UBL though closed down 4.6pc. AKBL closed lower by 7pc as the bank announced depressing profits due to higher provisioning. Consequently sentiments in FFC dampened as well, as FFC has recently become a stakeholder in AKBL. FFC closed down 0.7pc. Sherman sales desk visualised market to trade neutral to positive going forward as the flow of results would keep sentiments alive. Market was expected to move on developments and decisions during the PM�s visit to US. Samar Iqbal at Topline Securities stated the bullish sentiments were witnessed in cement sector after Fauji cement�s better than expected September EPS announcement of Re.0.44. FCCL gained 9pc with 14 shares changing hands. NRL closed 4.5pc down after earnings announcement of Rs.2.52 while Attock Petroleum earnings of 16.17 were better than investors� expectations. Ahsan Mehanti at Arif Habib Corp, observed that stocks closed higher in the first trading session post Eid with institutional interest in selected stocks across the board. Trade remained low amid uncertainty in global stocks and commodities. Mreanwhile, speculations are rife on the positive outcome of PM�s meeting with US President due this week. In all, 314 stocks came up for trading with plus and minus in the ratio of 174 and 119. Market capitalisation increased by Rs20bn to Rs5.175 trillion. Among the volume leaders, Askari Bank (right shares) trading Spot, slipped 78 paisa to 91 paisa on day�s highest turnover at 20m shares.